P22 Mackinac Pro (pronounced Mackinaw) spans four centuries of type design, bridging the Old World with the New. This family of four weights and corresponding italics is of old style construction, with a diagonal weight stress. Contrast between thick & thin is modest and proportioned the same for all fonts. The tall x-height recommends itself to a wide variety of text and display uses; including advertising, publishing, signage and packaging. The P22 Mackinac Family contains 24 styles: 8 Pro styles for applications that support OpenType features and 16 companion styles in basic OpenType format for use with document-based applications. P22 Mackinac Pro OpenType features include: small caps, ligatures, ordinals, numerous figure options and other bonus features. 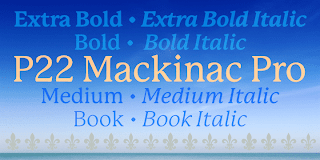 Mackinac supports 56 languages using extended Latin character sets. When reading conditions are less than perfect: small size, cheap paper, only a momentary view, you need a clear typographic voice. You want to choose a skillful product of the type designer's art. 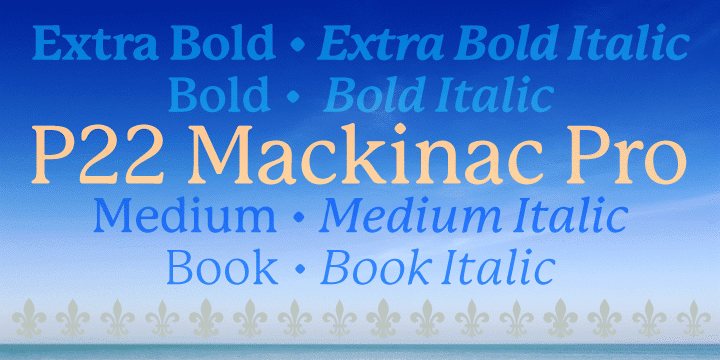 Mackinac Pro accomplishes the task with grace and elegance and is as much a pleasure at display sizes as in text. Single basic OpenType styles start at $19.95. Special limited time offer: order The Mackinac Pro Family through September 30, 2011 and receive a 20% discount. Click here for more details and to see the font. Downloadable PDF specimen is available under the full set tab.